On our social media platforms yesterday we discussed the importance of doing things you love to stay physically fit. The same thing goes for maintaining a healthy diet – contrary to popular belief, you don’t have to eat only fruits, vegetables, and lean meats to be healthy. Every once in a while, you can indulge in a nice, delicious meal – the key is to make it as healthy as possible, all while tasting incredible. 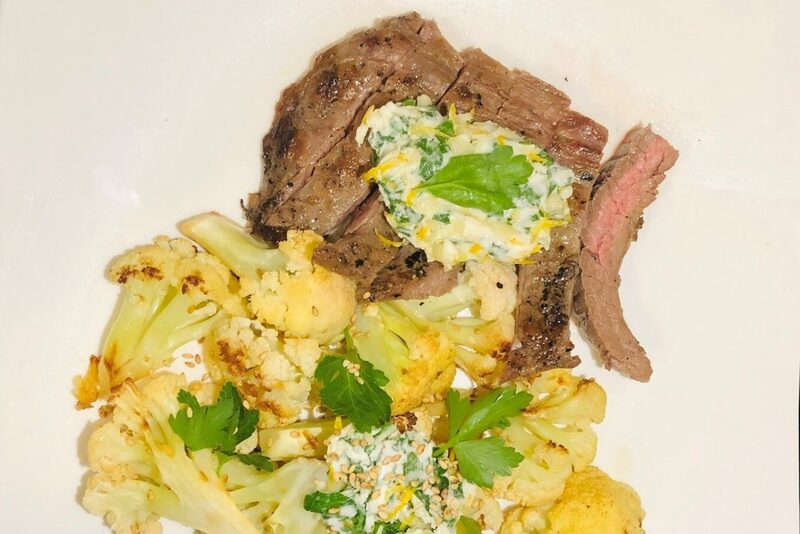 Check out this steak dish, prepared by Attune Health nutritionist Natalie Fortune, and see how delicious healthy can be! Take the butter out of the fridge and allow to come to room temperature. Mix until evenly combined, and store in the fridge until ready to use. This can be done a few days in advance. On a baking sheet, spread the cauliflower evenly, drizzle with 2 teaspoons avocado oil, season with salt and pepper, and toss to evenly coat. Place in the oven for about 25-30 minutes until tender and starting to brown. While the cauliflower is cooking, you can prepare the steak. Heat a cast iron pan over medium heat. Season both sides of the steak with sea salt and black pepper. When the pan is hot, add 1 teaspoon of avocado oil. Add the flank steak, laying it away from you into the pan. Cook steak for a few minutes on each side to brown, and cook to desired temperature. Take the steak out of the pan and allow it to rest for a few minutes before slicing. When the cauliflower is cooked, take out of the oven and squeeze half of the lemon juice over it and sprinkle with sesame seeds, toss to evenly combine. Slice the steak and serve with cauliflower, topped with compound “butter”. Garnish with parsley.